Terrace gardens have always exuded that charm of privacy and quite which allures one into its mysterious labyrinths of greenery. It might seem like a line out of a fantasy novel but it is sort of true for people who are a little mad for green spaces. With the majority of population living in apartments, in the middle of sprawling concrete structures, terrace gardens act as an escapade from the cacophony of the asphalt jungle. Start with drawing a rough layout of your terrace space on paper. You don’t need to draw a very detailed plan but just include all the jutting corners which pose a problem during execution. What purpose will your terrace garden serve: do want to use as a peaceful escapade to sit and enjoy the greenery, or for your night time parties or creating a vegetable and herb garden? This is an important question which you need to decide before thinking about anything else. This step is a little difficult: decide how you want to use up the space, i.e. where do you want to place your furniture, how much area would you like to assign to the plants and the like. In a way you decide chalk out the layout of your terrace. The best thing to do is make a list of things you want and then negate the ones which are not feasible. This way you would be left with a smaller list which will make this step easier for you. Once you have determined the layout of your terrace space (above point), decide the kind of plants you would want. There are two major factors to be kept in mind: 1) space and (2) climate. You have to be careful about planting trees like bamboo which look great with their umbrella of green leaves, but are difficult to control in a terrace garden due to their fast growth rate. The climatic conditions of a region are a major determining factor for the kind of plants you can grow in your terrace garden. Also please keep in mind that there will be abundant sunlight on your terrace, so create a shade or a green fabric cover during the summer months. Decide the kind of planters you want to install: permanent or temporary. Permanent ones are a patch of earth where you want to plant big trees. Temporary ones are ideal for terrace gardens: they come in all shapes, sizes and materials and are easier to maintain. Creating a garden just so you can admire it is not the end of the story. Plants need water twice daily during summer months and once every day (or less) during winters. If you plan to go on a vacation, please make sure that there is someone who will look after your green cover. You can also install automated irrigation system which keeps all your plants nourished without disturbing your neighbors for their help. Also, contrary to other beliefs they are inexpensive. Outdoor Furniture for your terrace garden is the next thing to decide on. Before buying those comfortable chairs keep in mind that they will be exposed to harsh sunlight everyday even if you keep it under a shaded area. Thus invest in lighter and strong materials like bamboo etc. Use colourful rugs and cushions to your secret garden to make it more interesting. Water bodies are of two types: permanent and temporary. So if you want to install one or two of these, take into account the area available and the feasibility as well. 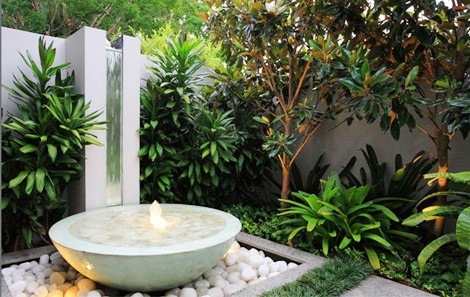 Water bodies add a soothing sound reminiscent of a small stream flowing nearby. You can also add sculptures in your garden. Usually stone sculptures go very well with Indian gardens. However, if you want to opt for a neat little garden (with all the plants and bushes trimmed), then you could experiment with a variety of other materials and shapes. A terrace garden usually becomes unusable as night falls. You can use soft landscape lights which are not very bright but serve your purpose. Please keep in mind, plants should not be subjected to very bright lights as it affects their growth. One of the things which all of us usually want in a terrace garden (or any garden for that matter) is grass. However, as growing grass is not really easy on ground, it is way too difficult to do it in a terrace garden. The main reason is the harsh weather conditions. So the best option is to buy a sheet of artificial grass and spread it out to add more green to your terrace. If you are a foodie and love the idea of cooking and eating delicious food in your garden, you could buy a barbeque grill. There are loads of options available both electric and manual which are compact and allow you to enjoy the winter sunshine with the beautiful aroma of barbeque spreading through. So have a blast creating that secret garden or a party place of your own escaping the prying eyes of your neighbours!